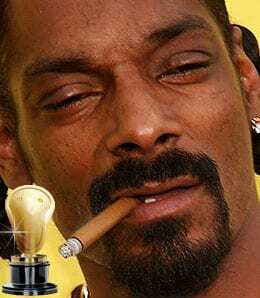 We wrap up the 2010 RotoRob Awards with our hardware for the Gridiron Heroes and Goats. It took an injury for Michael Vick to ascend to the starting job for the Eagles, but he’s holding the gig like…err…a dog with a bone. Michael Vick, QB, Philadelphia Eagles: When Packer linebacker Clay Matthews pasted Kevin Kolb’s face into the grass at Lincoln Financial Field in early September, it led to perhaps the defining event of the Fantasy football season. 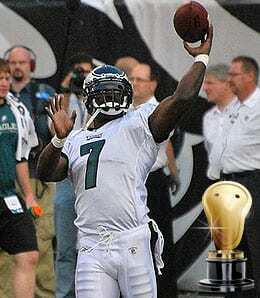 Vick stepped in for an injured Kolb that day and took the reins of the starting job permanently soon after. 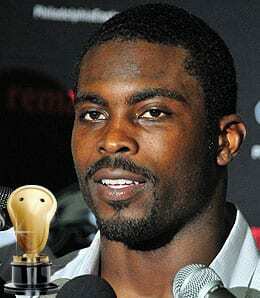 While Tom Brady may walk away with league MVP honors, Vick has been the apple of any Fantasy owner’s eye. Prior to Week 16, which is widely considered to be championship week for many leagues, Vick leads all players in Fantasy scoring. The eye-grabbing part of this accomplishment is that Vick played in only ten games as a starter, leaving one of those starts with a rib injury. If he played a regular slate, one can only imagine where he would be at this point. His earth-shattering performance versus the Redskins in Week Ten (330 yards passing, 80 yards rushing, four TD passes and two rushing scores) ranked as one of the greatest Fantasy performances of the last 25 years. Vick’s numbers under the circumstances are somewhat astonishing. His work through the air has been vastly improved. For example, he has thrown for at least 250 yards in seven of his ten starts. During his time with Atlanta, he only had six of those performances in six seasons. However, Vick’s work on the ground puts him in another stratosphere. He has two 100-yard rushing performances to his credit and has 28 total touchdowns including eight rushing. It took a while but Vick finally has arrived as an NFL quarterback. Arian Foster (who has exploded into the top running back in Fantasy football and has joined Priest Holmes as the only undrafted players in NFL history to gain over 2,000 yards from scrimmage in a season), Tom Brady (who has now throw an NFL record 319 straight passes without getting picked off), Philip Rivers (who has been spectacular again, topping 4,000 yards for the third straight season) and Aaron Rodgers (who capped another big season by shaking off a concussion this week to earn his first career 400-yard passing game). Yes, Steve, you’ve put your owners to sleep with your ineptitude. Steve Smith, WR, Carolina Panthers: Considering his hype coming in, I really wanted to go with Ryan Mathews here, but considering he is a rookie, that seems somewhat unfair. Instead, I selected Carolina’s Smith, who languished this season with quarterbacks ranging from Matt Moore, Jimmy Clausen, and Tony Pike to the immortal Brian St. Pierre. As a result, Smith’s numbers have hit a six-year low. Receivers like Calvin Johnson and even Larry Fitzgerald manage to be somewhat productive even with the most mediocre of quarterbacks. Even playing on a team that trails the opponent religiously in 2010 has not helped Smith’s numbers. Once considered a borderline top 10 or top 15 receiver, those days appear to be long gone. Ryan Mathews (who, as mentioned was so hyped, yet so underdelivered on that promise), Donovan McNabb (who struggled through his worst season since he was a rookie), Ronnie Brown (he has one more TD than he has fumbles) and Brandon Marshall (Brown’s teammate also has one more TD than fumbles). Mike Williams stands head and shoulders above the rest of his rookie class. Mike Williams, WR, Tampa Bay Buccaneers: Although this was a rather underwhelming rookie class, Tampa’s Williams is the runaway winner in this category. He will finish the season as a Top 20 fantasy receiver and also owns more touchdowns heading into Week 16 (eight) than DeSean Jackson, Larry Fitzgerald, and Miles Austin. The aforementioned gentlemen were consensus Top 10 Fantasy receivers, while Williams was a fourth round pick in the 2010 NFL Draft. Sam Bradford (who did a pretty damn good job of showing why he was the No. 1 overall pick in the 2010 NFL Draft) and Jahvid Best (who could be ready to be an every down back next season). Every dog has his day, and in 2010, it was Michael Vick’s turn. Michael Vick, QB, Philadelphia Eagles: Prior to his Week Two start against Detroit, he had not started a game since New Year’s Eve in 2006. 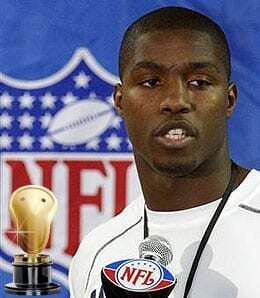 Honorable mention goes to Denver’s Brandon Lloyd but he didn’t endure the fall from grace that Vick did and he may not be classified as a comeback player per se since he wasn’t exactly Pro Bowl stock prior to busting out in 2010. As noted above, Vick is back. Matt Ryan (who backslid last year after a fine rookie season in 2008, but has taken a big step forward this year), Darren McFadden (who showed a bit of promise as a rookie, but was rancid in 2009 before breaking out this year) and Michael Turner (who, while not bad in 2009, did miss five games and this year has stayed healthy and bounced back while doing a great job of hanging onto the ball). Pure brilliance. Why hasn’t someone thought of this before? Forget about the Super Bowl. How about the Super Barbecue? Let’s just get two teams of 45 guys together and let them cook a bunch of burgers with 80,000 people watching. I love it! Derek Anderson’s play is no laughing matter. During Arizona’s embarrassing 27-6 loss at home to San Francisco in Week 12 — a loss the entire football world saw thanks to it inexplicably being the Monday Night Football game — Cardinal quarterback Derek Anderson was caught on camera sharing a laugh with a teammate on the sidelines while his team was down by 18 points. When grilled on this by a reporter after the game, Anderson went ballistic. He never really answered the question, instead employing the old “the best defense is a good offense” tactic by going on a massive tirade that was supposedly designed to show us all that he’s very serious about football. All it showed me was that Anderson is a knob. See the whole tirade for yourself here. It’s a true classic. I’ll be honest. I can’t think of ten receivers that I’m incredibly high on in 2010. There are just red flags nearly with every player, especially in the top ten. Meanwhile, without a stellar running game, Schaub attempted 583 passes in ’09. If the running game doesn’t turn it around, envisioning Schaub dropping back 600 times without suffering some sort of an injury may be wishful thinking. Bear with me through our latest voyage. Thanks to the Phils’ World Series loss, I’m in a bit of an ornery mood these days. My email box and Facebook account has been swamped with arrogant and cocksure emails from Yankee fans celebrating title 27. And most of them I can’t even put in print. As we stand days away from a potential Phillies-Yankees World Series and the biggest sports fan battle to hit the east coast in decades, it is time to issue a test.